Just as other industries are experiencing disruption, scholarly research is undergoing change. Globalization and technology are transforming research and publication processes. Although these two forces promise to deliver significant benefits in terms of research innovation and academic advancement, they are also increasing the competitive pressures of scholarly publishing. 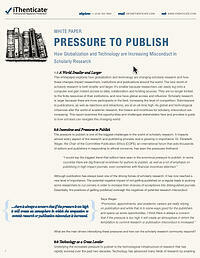 iThenticate's white paper, Pressure to Publish: How Globalization and Technology are Increasing Misconduct in Scholarly Research, offers guidelines for how the research community can combat the rise of misconduct and retractions, including how to implement effective processes to protect intellectual property and how to use technology to help screen for originality. Featuring: Dr. David Everett, Department of Food Science, University of Otago; Dr. Benson Honig, McMaster University Degroote School of Business; Dr. Liz Wager, Committee of Publication Ethics (COPE). Follow the discussion about the white paper and share your thoughts by posting a comment on the iThenticate Blog. If you are an iThenticate customer, you may skip filling out the below form and email us for a direct link to the white paper. Copyright © 1998-2018 Turnitin, LLC. All rights reserved.